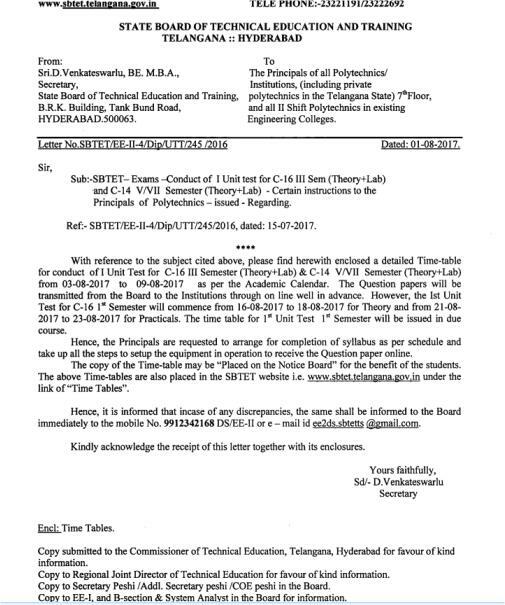 TS SBTET-Exams-Conduct of I Unit test for C16 III sem (Theory+Lab) and C14 V/VII Semester (Theory+Lab) - Certain Instructions to the Principals of Polytechnics. Telangana State Board of Technical Education and Training announced the 1st Unit time table for C16 and C14 curriculum students. From the following links you can see your time tables. With reference to the subject cited above, please find here with enclosed a detailed time table for of 1st Unit test for C-16 3rd semester (Theory+lab) and C14 5th/7th sem (Theory+lab) from 03-08-2017 to 09-08-2018 as per the academic calendar. The question papers will be transmitted from the board to the Institutions through online well in advance. However the 1st Unit test for C16 1st semester will commence from 16-08-2017 to 18-08-2017 for theory and from 21-08-2017 to 23-08-2017 for Practicals. The time table for 1st unit test 1st semester will be issued in due course.